Okay, people. 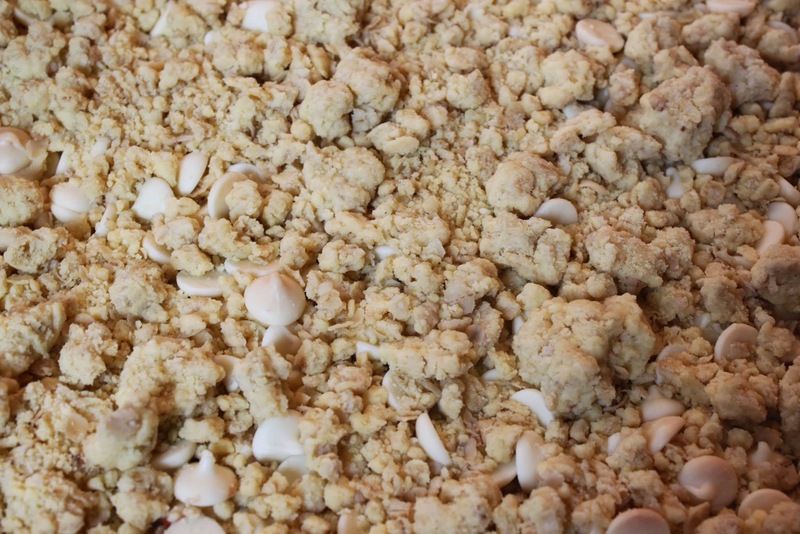 I’m posting two recipes this week that involve a crumb topping, and how can I not? Crumb topping is one of the great joys of life. Any baker knows that when crumbs are involved, the ratio of crumbs to cake has to be disproportionate. As in, tons of crumbs. TONS. And just a bit of yummy cake. Well, these aren’t cake. They’re bars. But really, who cares? It’s all about the crumbs, baby! And this simple recipe has crumbs upon crumbs to the point that they’re spilling out of the pan and straight into your mouth, where they melt as you sigh in ecstasy. Before I keep using the word “crumbs,” let me explain how this magic happens with little effort on your part. See, this recipe uses yellow cake mix. Yep, it’s a cheat! And quite a good one, I might add. 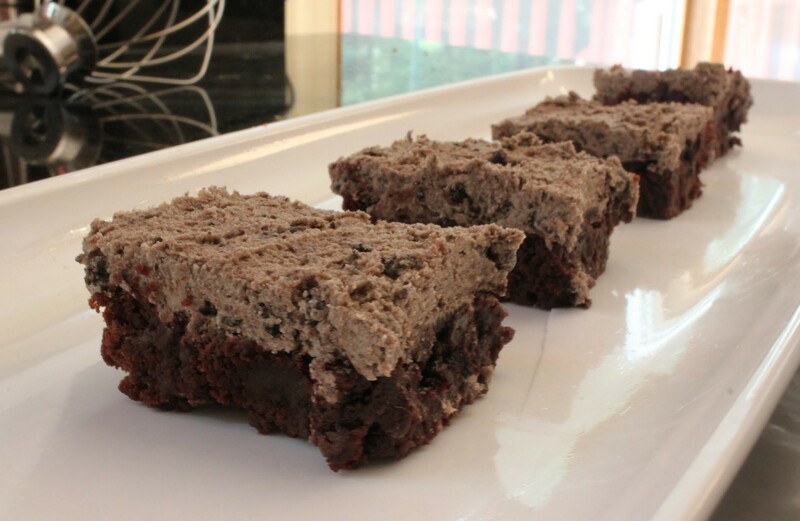 Whipping this up takes ten minutes or less, and what better way to use up a box of cake mix that has been sitting in your pantry for too long because your husband bought it by accident when you told him you wanted all-purpose flour? Sorry, sorry. I got carried away again. It happens. Ahem. Back to the yumminess. See how I couldn’t stop the crumbs from falling onto the plate? That’s a good thing, y’all. 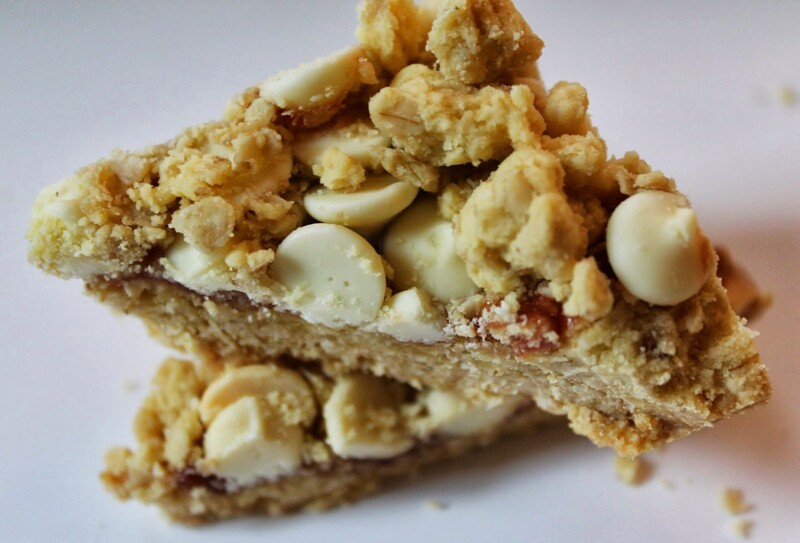 Basically, you mix the quick oats into the yellow cake mix, add melted butter, and make crumbs. Some of them go in the bottom of the pan for crust, and the rest of them get crumbled on top. You can pick your filling. I chose strawberry jelly and white chocolate chips, but raspberry jelly and dark chocolate would work just as well. It’s not about that. It’s about the topping, which we’ve already established. See the topping? It’s crumbtastic! The result is rewarding and addictive. I’m not really a yellow cake mix person, but in this form it’s both unrecognizable and fantastic. 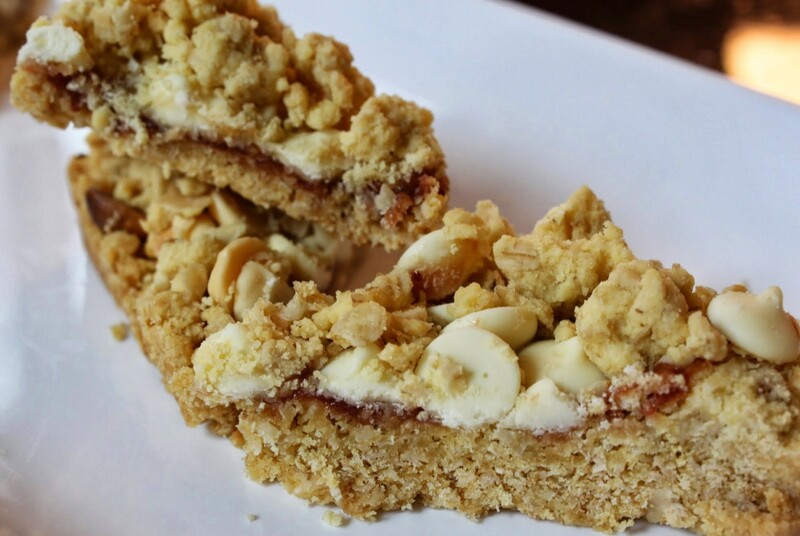 And let’s face it: I’m also a sucker for a good bar cookie. Especially one that I can make while my three kids are having a play date with two other kids and I’m trying to make sure that nobody gets maimed. Give this a shot. It’s foolproof, and you’ll impress your friends! Crumbs. Crumbs. Crumbs. It’s go time! Preheat the oven to 350. Line a 9 x 13 pan with foil, letting the foil overhang the sides of the pan for easy removal later on. Coat with cooking spray. In a bowl, combine the yellow cake mix and oats thoroughly. Pour in the melted butter and stir until the mixture forms crumbs. Press several handfuls of the crumb mixture into the bottom of the pan to make a crust, reserving the rest. 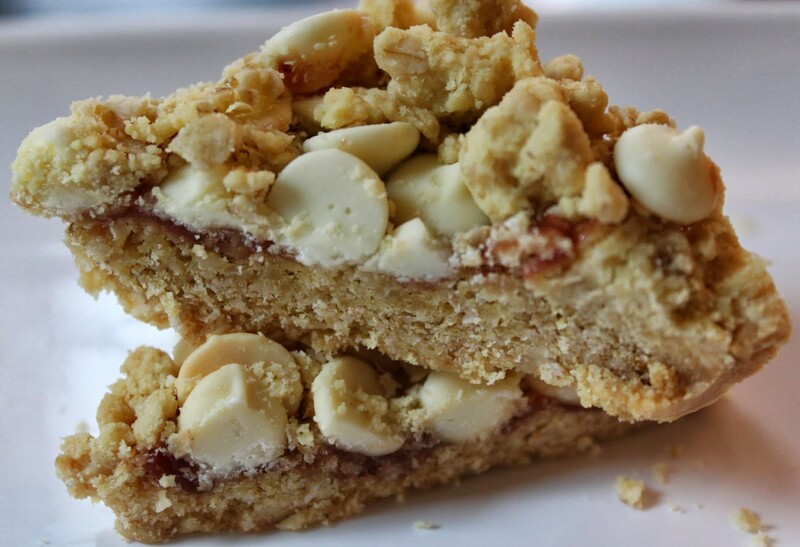 Spread a thin layer of jelly over the crust, and then sprinkle the white chocolate chips over the jelly evenly. Finally, crumble the rest of the topping over the chocolate chips, being sure that the crumbs vary from larger to medium-sized. Bake for 25 minutes until the crumbs are turning golden. Remove from the oven and cool. Cut into bars or triangles. Store in an airtight container for up to one week. I fulfill many roles in life: wife, mother, teacher, everlasting learner. This site is dedicated to one role that expresses my creativity in ways that I find consistently challenging and rewarding: baker. Inventing new ways to enhance food, especially if that food involves chocolate or peanut butter (or both! ), is a passion of mine. I look forward to sharing my ideas with you. Have we talked much about my favorite cookie? Probably not, especially in the summertime. Who bakes snowball cookies in the summer? Well, I do. 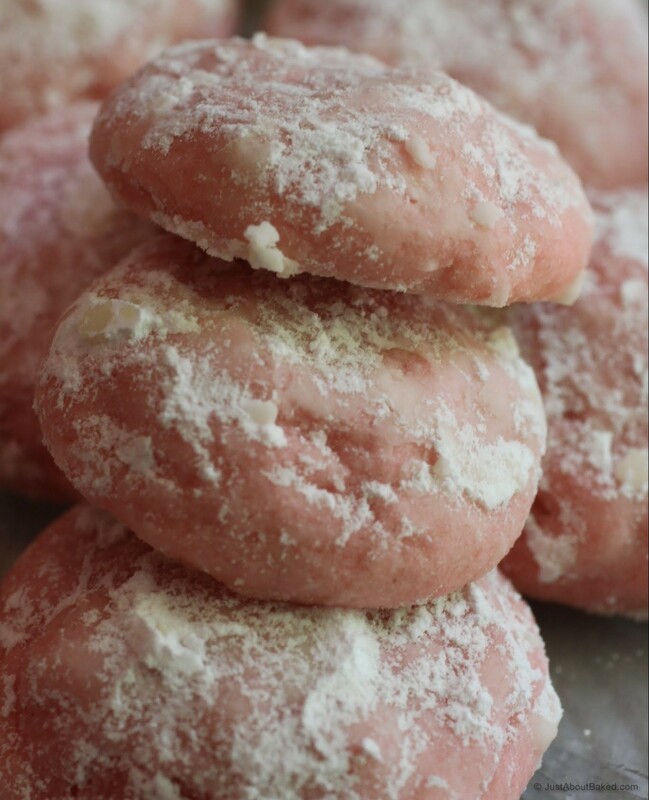 This pink lemonade version has taken my favorite winter cookie and morphed it right into summer where it belongs. It’s pink and cute and ridiculously tasty. Those are all fantastic reasons to eat a cookie! Another reason to eat a pink lemonade cookie? Lemon is a summer flavor. In fact, as you’re reading this, I’m at the beach with my buddy getting some girl time. And you can bet your patootie that we’ll be getting some fresh-squeezed lemonade on the boardwalk! Whatever ice cream you love, whatever your favorite is, that is about to change. That’s how (over)confident I feel about this. Prepare yourselves! Years ago, I tried Ben and Jerry’s Cheesecake Brownie flavor. And it was such a great flavor. 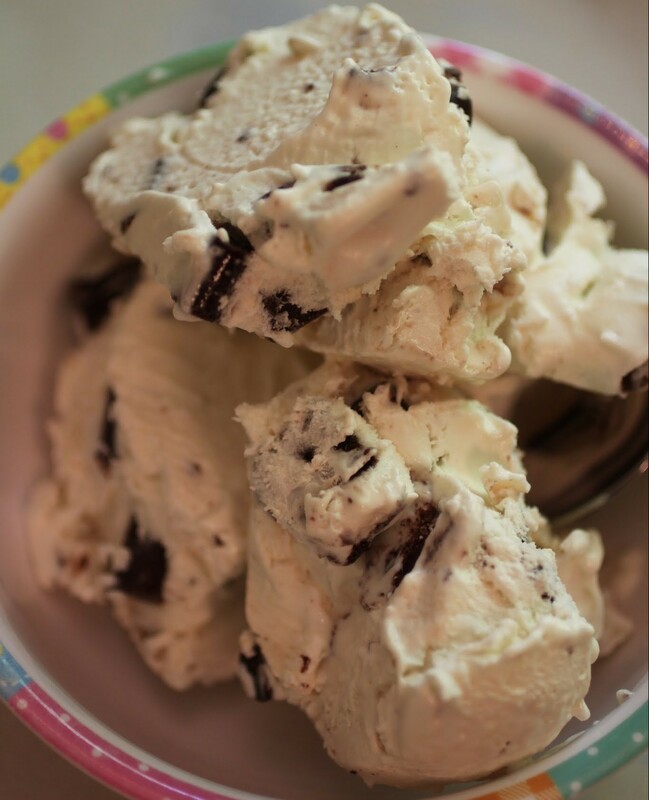 After all, what could be better than cheesecake ice cream with brownie chunks? I asked myself that very question while I made this ice cream. Answer? Cheesecake ice cream with BIGGER brownie chunks and chocolate chunks to boot! You’re welcome. Feel free to send me an award of some kind. I think we all have our weaknesses. Some are more serious than others, for sure. People argue quite heatedly whether sugar is an addiction, and I’m going to ignore all the studies and state with quite a bit of certainty that if sugar’s not an addiction, it sure as heck comes close. Because anything that I crave this much is entering danger territory. I’ve tried to fight it. I even went two months sugar-free last year to see what would happen. Nothing happened. I didn’t have cravings as madly as I’d supposed, but I also never lost the desire to eat chocolate. So there you have it. Crumbs are definitely my undoing. The more, the merrier! 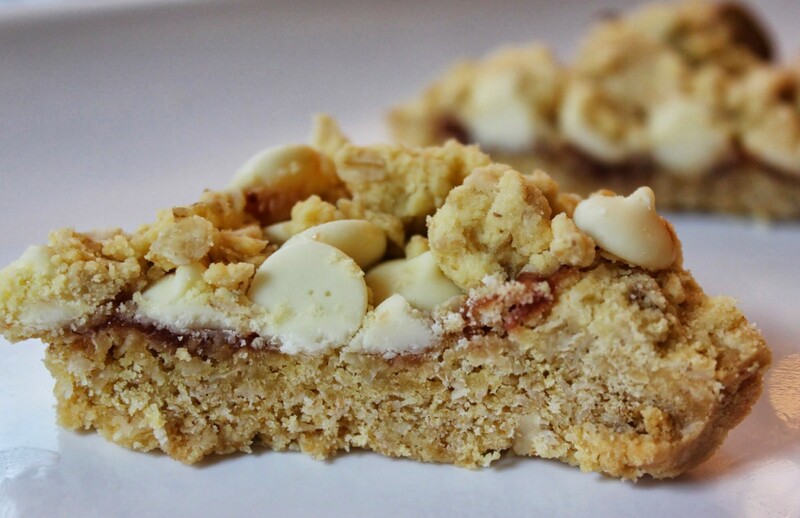 These look amazing, I love crumb toppings, I love white chocolate and I love strawberry jam! This has been featured as one of my favourites over at Sweet and Savoury Sunday. Stop by, grab a button and link up again with us this week. Have a great day! Wow, thanks so much! I’m excited to share more recipes with you! This looks delicious! Almost time to go on our annual strawberry picking trip. One more great strawberry recipe for us to make with all those succulent berries! Thank you! Wow, what a great trip! I love fresh strawberries. So much better than store-bought!